Home BOLLYWOOD Did Aditya Roy Kapur Just Propose To Katrina Kaif? Did Aditya Roy Kapur Just Propose To Katrina Kaif? [tps_footer]As you can see in these photos, Aditya Roy Kapur on his knees, with a bouquet of flowers for Katrina Kaif, he did not propose, but he gifted her the flowers. 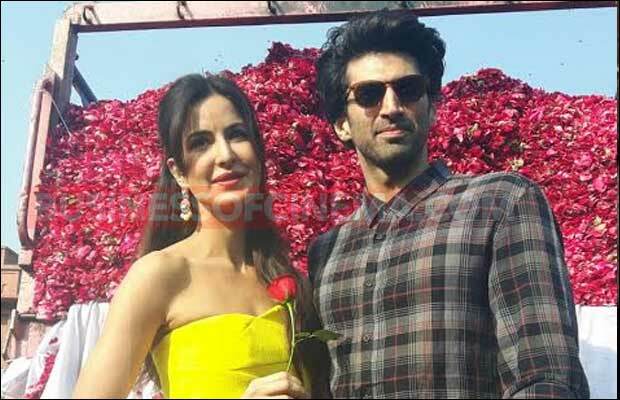 On the occasion of International Rose day, Katrina Kaif received a record number of roses from her dear co-star Aditya Roy Kapur. As Rose day is celebrated across the country on the 7th February each year i.e. exactly one week prior to Valentine’s Day (14th Feb), Aditya thought that this would be a perfect gesture to make his co- star feel special. Aditya–Katrina who are in the pink city of love, Jaipur, to promote their upcoming film Fitoor, celebrated the occasion at Jai Mahal. Aditya Roy Kapur gifted literally a truck full of fresh and lovely roses to his leading lady. The actor who will be seen romancing Katrina Kaif on screen in their upcoming love story planned this really romantic gesture to surprise Katrina on February 07, 2016. The idea came to Aditya a couple of days back when he immediately got on to make arrangements for it to be ready in Jaipur where they are promoting Fitoor. He definitely wooed Katrina by gifting her a truck filled with about 1 lac roses. No girl must have received so many roses in one day alone! Katrina was absolutely surprised and deeply touched with this gesture and gave a big hug to Aditya while thanking him for his unique gesture.